Facetime for Android | Facetime Alternative for Android | Free Pc to Phone Calls, Free Voip Calls to India International ! Its the year of smartphones and almost all have access to internet on mobile. And the most popular thing which we all do on smartphones is video calling. If you have iPhone, iPod Touch, iPad or any Apple device and still not tried Facetime for video calls then its time to do so. Facetime works really great with amazing video call clarity. I am a regular user of Facetime on my iPad and have been its Fan from day 1. The easy to use user interface coupled with excellent quality makes Facetime number #1 video calling app (atleast for me). But what about our Android users. The number of android users is probably lot more than iPhone users, simple reason is that Android is an open source and so many mobile companies are using this operating system. Infact large number of our blog readers are using Android mobile phones. So what about making video calls on Android mobile. Though there are many video calling apps for android as well (like Tango), which people do use. But the question is what about Facetime for Android. Apple was earlier planning to make Facetime available for all the operating systems (including windows mobile and android), however till date we do not have any official Facetime application for android mobiles. It would have been great if Apple would have launched it officially for android users, this way we would have been able to seamlessly make video calls between iPhone to Android and vice versa. Now since, we do not have Facetime client for Android, this does not mean that we do not make video calls between Android and iOS Device. So, the question now is "Do we have any Facetime alternatives for Android Mobiles". Obvious answer to this question is "Yes". ooVoo : I would say it is one of the best video calling application in terms of quality. Highly recommended for video calling on android devices, it works great! Skype App for Android Mobiles : I use this all the time for video calling with my friends and family. It the oldest and biggest voip service and most people use this. Tango on Android : As I said earlier in the post, it is one of the best apps for android phones. Fring : Amazingly they also have a video calling solution and it also works on android. Vtok for Android: Also popular as google talk atlernative (vtok for gtok/gtalk) and it make use of your gmail login for voice and video chat. One of very good app for android. These are just few, the list of facetime alternatives is pretty long (Rebtel, Ficall etc..). Almost all the video calling apps for Android Mobiles can be considered as another option apart from Facetime! What about a video calling solution from Google itself. Last year, Google announced an updated version of Google Talk that will bring voice and video chat to Android phones, starting with the Nexus S. With the 4G technology and high end phones (quad core/dual core processors), it will be easy to support the Google Video Calling (Gtalk Video) on android mobiles. The quality is also expected to be good. It is expected that the new version of Gtalk for android mobiles will allow users to voice or video chat with Google Talk users on Android tablets, as well as on computers using Google Talk with Gmail, over 3G, 4G, and Wi-Fi connections. Please note that Facetime works with Wifi and not 3G. As you can see in the video below, this Google Talk video chat feature seems better than Facetime in many ways (who know Apple may launch upgraded version of Facetime soon). So, Google Talk will also overlay text sent via instant messaging on top of your video chat screen, so you can conceivably follow links sent during chat. 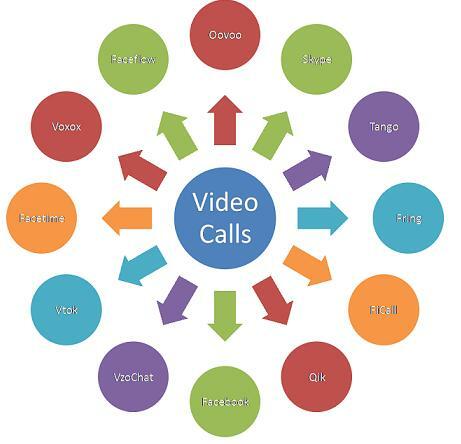 I am a fan of video calling and prefer it over voice calls or text messages. I believe the video calling technology has not really kicked off, may be because not any cheap mobiles phones are available having video calling feature, technology is still progressing (not many video calling apps for 3G). Check the video below about Google Talk Video Calling! Is anyone aware about this official video calling feature of Gtalk for Android. Is anyone using it ? Please share with us in the comment section.